What happens if you want a nice sharp jolt of wasabi in between your gums after a meal? Do you go looking for an Asian grocer? 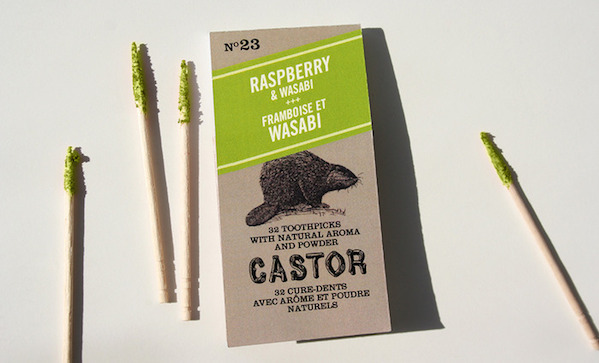 Nope, just reach for your Cator toothpicks ($10 for two flavours, $50 for all ten)—excuse us, double gourmet flavoured toothpicsk—which are now on Kickstarter. Wasabi aside, the root beer/fir flavour looks like it’d be a good palate cleanser, and the bacon/maple seems like a no brainer. We actually have been using flavoured toothpicks for a year now (that’d be Daneson straight single malt flavoured toothpicks), and we have to say, they’re pretty great. So we’d give these a shot, is what we’re saying. Especially that habanero/honey in a paloma.